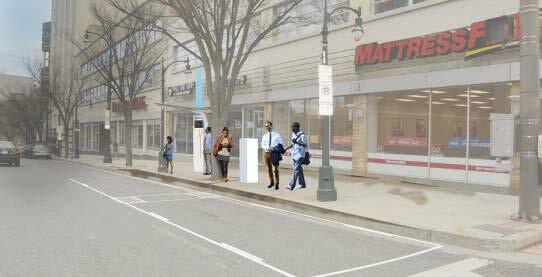 Montgomery County’s first bus rapid transit line will open in Silver Spring in 2020. This month, we got our first glimpse of what the stations could look like. What Montgomery County's new Flash bus rapid transit stations could look like. All images from ZGF. The new BRT line, dubbed Flash, will run along Route 29 between the Silver Spring Metro station and the Burtonsville Park & Ride. It's the first of what could be a countywide network of rapid bus lines. Flash will contain a variety of features designed to make the bus faster and more reliable, including dedicated lanes for part of the route and special signals that give buses extra green time at congested intersections. The 11-mile line will have just 12 stations, spaced up to two miles apart, and could carry 13,000 people per day. And those stations won’t look like any bus stops you’ve seen in the area before. Designed by local architecture firm ZGF, the stations are designed to be visually distinctive, while adaptable to the wide variety of urban and suburban neighborhoods along the BRT line. A plan showing all the features of a BRT station. The designers have created a canopy structure for each station with a mix of metal, wood, and glass accents. The stations will also have an iconic “station marker,” which will help riders find each station and provide real-time information and a system map. The stations will all be accessible for riders with disabilities and have ticket machines where riders can pay before getting on the bus, reducing delays. How the Fenton Street BRT station could look. However, no two stations will be exactly alike, as the designers created a “menu” of station features that the county can pick and choose from based on the needs of that specific location. 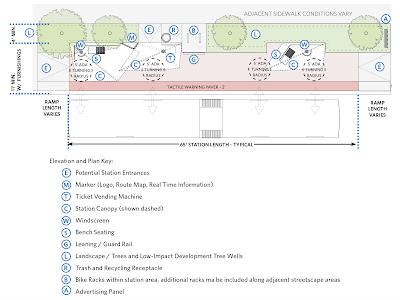 Those amenities include public art, wifi and cellphone charging spots, or low impact design (LID) landscaping, which can collect and distribute rainwater, reducing runoff and pollution. The stations will be different sizes based on their location. Busier stations might have larger shelters to accommodate multiple buses. Locations in downtown Silver Spring might have smaller shelters to fit on tight sidewalks, while more suburban stations will have more green space around them. A "menu" of options would allow each station to fit into its surroundings. These designs are still preliminary, so we don’t have a lot of details about how much they’ll cost. 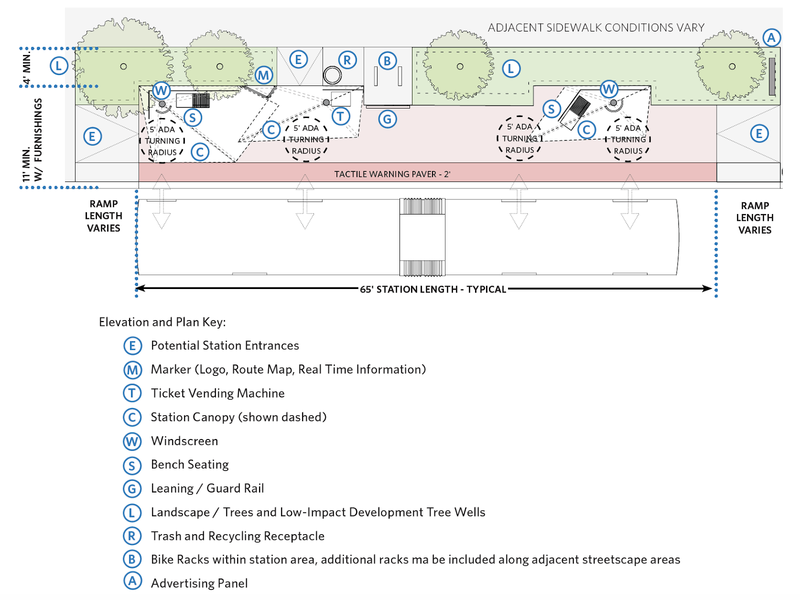 But one estimate in the designers’ report says that each station could cost between $368,000 and $490,000. The entire BRT line will cost $31 million. There’s no reason infrastructure can’t be both functional and attractive. Do you think these hit the mark?